I wish it was rackable. UltraLite, FireWire audio interface from MOTU in the UltraLite series.
" This is a CIBIE?" 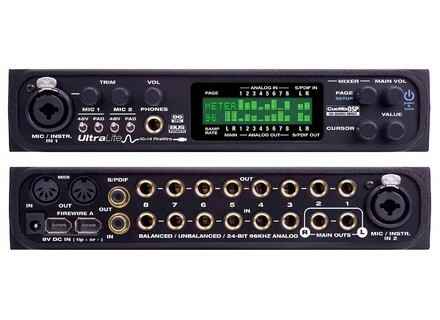 The Motu Ultra Lite is a audio interface that connects to your pc through fire wire, you computer would need to have a fire wire port in order for you to be able to use this device. If you don’t have a fire wire port on your computer don’t even bother purchasing this. You will need to get a USB interface instead. There is a large debate on if fire wire is better than USB, in my opinion you wont really be able to tell a difference in quality just maybe the USB will have a little more of a lag, but in most cases the lag is so minimal that the ear cant even pick it up. But there is a lag in fire wire too, so don’t think if you purchase the Motu Ultra Lite that you wont have any lag at all, because all interfaces have some sort of a lag. But you wont be able to tell there is a lag when using the Motu lite. The Motu Ultra Lite is a complex little interface, it is very powerful for it to be such a small unit. There are plenty of ins to run all of your audio in signals into so you can do whatever you want to do with them , in my case I used it to get audio into my pc from external gear. The sound is very good, you will love the quality. But I think that the price of this unit brand new is a little too expensive. Even a used one can still cost 200 or more dollars today and it has been out for a while now. There are several fire wire interfaces that are great, the Motu Ultra Lite is a great one as well, I just feel like it is an overpriced unit because its just too expensive. Maybe if it was this price and it was rack able then it would be different or if they offered a rack able version of this same device I would feel different about it.